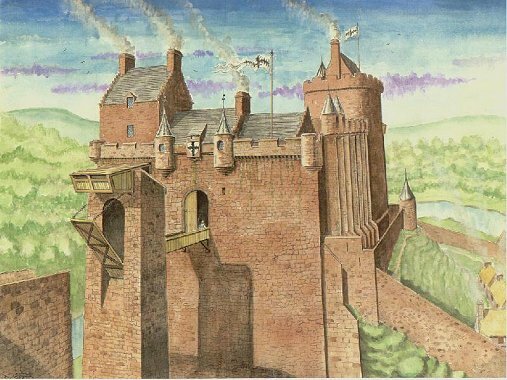 Some ten miles south west of Edinburgh sits the ancient castle of Roslin. The name Roslin is taken from it's location 'the Rock of falls'. Today the site of the 15th century castle although partly in ruins still strikes an impressive stance astride it's rocky spur almost encircled by a loop of the North Esk river. It was originally built by the Sinclair family, Earls of Orkney in the mid 15th century. Though there is the suggestion that both the castle and the nearby ornamental chapel are of an earlier date. It is said that the infamous Prince Henry Sinclair was born at the castle. He, it is claimed, along with Clan Gunn from Clyth castle in Caithness made the epic voyage of discovery to America, landing at Nova Scotia then on to Massachusetts. In fact an effigy of Sir James Gunn of Clyth who died during this trip is still in existence, being known as the Westford Knight. The castle's partly ruined state today is likely due to the siege by the English in 1544 in a campaign which became known as the wars of the 'Rough Wooing' where by use of castle burning throughout Scotland the English hoped to force the marriage of the infant Mary Queen of Scots to the English Prince Edward. Such castle assaults though resulted in Mary being sent to France where she married the Daphine heir to the French throne which further angered the English. The main modern apartments of Roslin are within the 1597 hall/kitchen block on the south east side of the castle site, raised on the foundations of an earlier 15th century wall. This section was originally five storeys high with a turnpike staircase and draw well hatches connecting each level. To the north sits the ruined shell of the gateway block-house. Directly in front of this linked by a collapsible wooden bridge was a single drawbridge tower. The space between these has been built up in stone in modern times, though it is still easy to imagine how formidable this arrangement must have been to any would-be attacker. The depth of the gorge between the site of the drawbridge and the site the originally outer bridge appears very impressive today. However this level is misleading since there has had an infill of at least 20ft of rubble debris from the ruined gatehouse. So that back in 1450 this gorge would have been much deeper and wider making any assaults from this front out of the question. The wall running west from the block-house is noteworthy being made up of seven V-plan towers mounted by bartizans (open turrets), two of which were originally roofed by conical caps. Why only two were roofed is a bit of a puzzle. 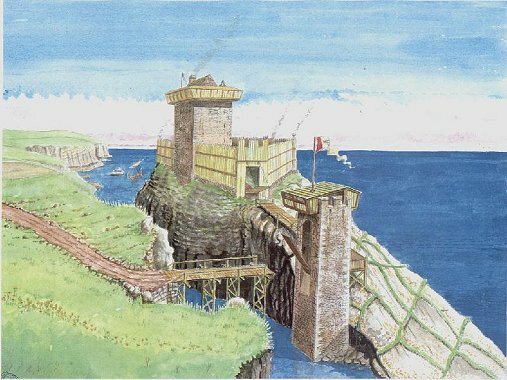 These towers by their shape and construction would deflect attacks by magonels and trebuchets (giant siege engines that hurled rocks) as this section would be vulnerable to assaults from the west, though the towers do appear to be overly ornate in their design. These series of towers led on to the great Keep, the tallest feature of the original castle, now sadly a shell of it's former stature. The Keep was oblong in plan with machicolated battlements and was very similar to Cranshaws tower near Duns in the borders. On the south-facing fragment of the Keep, well below the machicolations, are the marks of a lean-to roof at walk-wall battlement level, overlooking the site of the original walled medieval village of Roslin (now non-existent). This evidence suggests the presence of a roofed wooden hoarding slotted through and overhanging the stone battlements. From here, during times of siege, defenders could provide defensive archery fire for the castle and village without risk of injury to themselves. If the village fell and the besieging army approached the base of the west wall itself, incendiary devices would be dropped from the hoarding. Anything from burning oil, fiery faggots (straw bales) and a favourite toasted pig carcasses packed with goose grease with rope fuses which exploded and stuck to their victims on impact. A kind of medieval napalm! Obviously the hoarding was only a temporary line of defence and when it was damaged or set ablaze it was simply unslotted and dropped on the besiegers below, revealing the intact stone battlements behind. If this too was breached and entered by storm the garrison would rally in the great Keep itself as the final stand point since it could be sealed off from the rest of the castle. Unfortunately such well thought out defenses built around resisting boulders, arrows and siege ladders were no match for the arrival of gunpowder and in 1544 when these defenses were tested the keep and west wall were torn to pieces from several hundred yards away. A sad end to a well planned castle. After this more emphasis appears to have been placed on the 1597 block with additional work done in the 1620's. Thankfully enough remains of this unusual Sinclair castle today to fire the imagination of visitors.